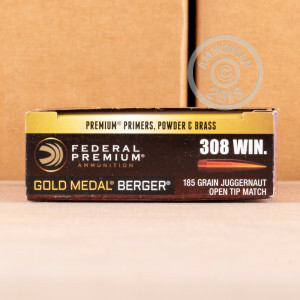 This 308 Win cartridge from Federal Premium’s Gold Medal line of ammunition features a 185 Berger Juggernaut OTM projectile. This bullet has been designed to deliver precise accuracy in every way. Its boat tail profile improves its ballistic coefficient for a flat trajectory, less wind drift, and more velocity retained downrange. Its open tip match design means that its core was poured through the aperture in its jacket’s nose while still molten, making its density remarkably uniform. 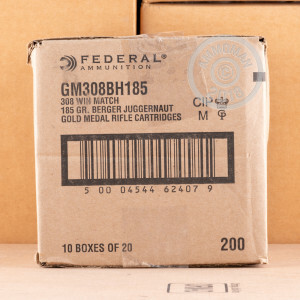 Finally, this round was loaded according to Federal’s absolutest tightest specifications, and the Minnesotan company is not known to cut corners even in their day to day manufacturing processes. All in all, if you’re looking to give your 308 virtually laser-like performance, this round stands by to deliver. This cartridge further features Federal’s own responsive Boxer primer, select fresh brass casing, and propellant formulated and weighed to deliver the chamber pressure perfect for its caliber. 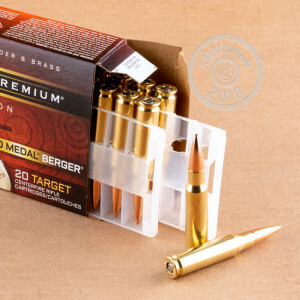 Its attributes make this round great for handloading, and its same original Berger projectile is available for purchase so you can keep enjoying razor sharp accuracy time and time again.